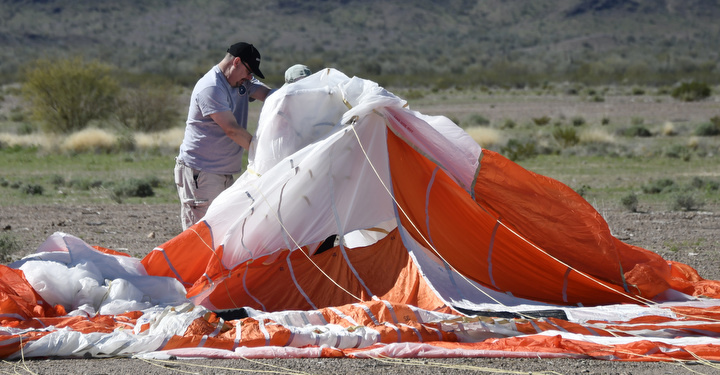 A model of NASA’s Orion spacecraft, in development to loft astronaut crews into deep space, was dropped from a U.S. Air Force cargo plane over Arizona on Wednesday in the latest in a series of tests to verify the capsule’s parachutes are up to the job of safely landing with humans on-board. 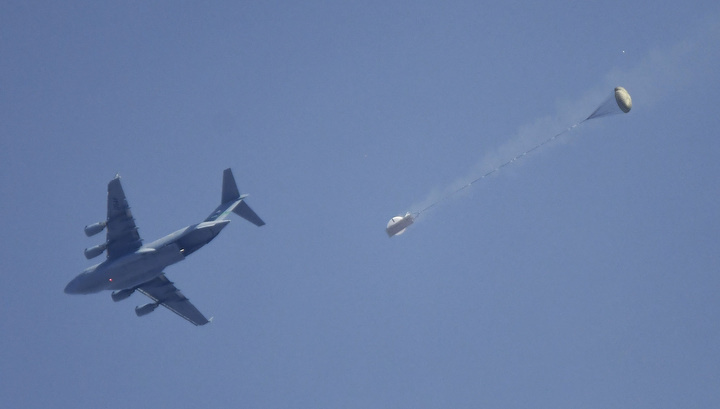 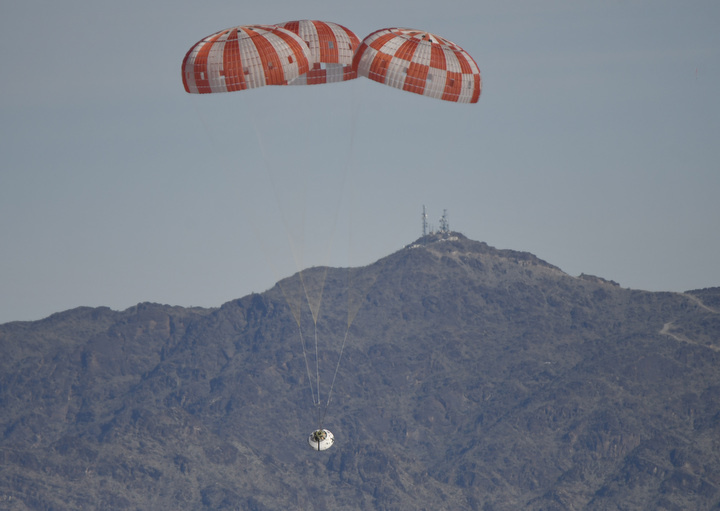 The instrumented test module, shaped like the real Orion capsule with a foam shell, was deployed from the cargo bay of the C-17 transport plane at an altitude of 25,000 feet — about 7,600 meters — Wednesday morning over the U.S. Army Yuma Proving Ground in Arizona. 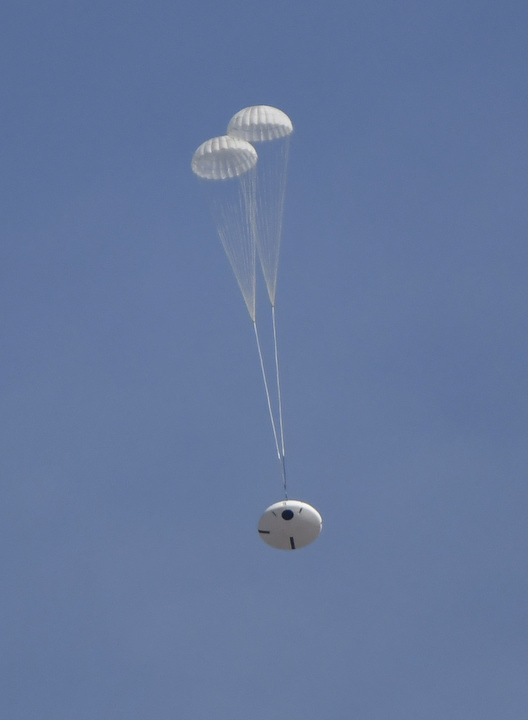 Two drogue parachutes unfurled to steady the descending capsule, then three 116-foot-diameter (35-meter) orange and white main parachutes inflated to slow down for landing. 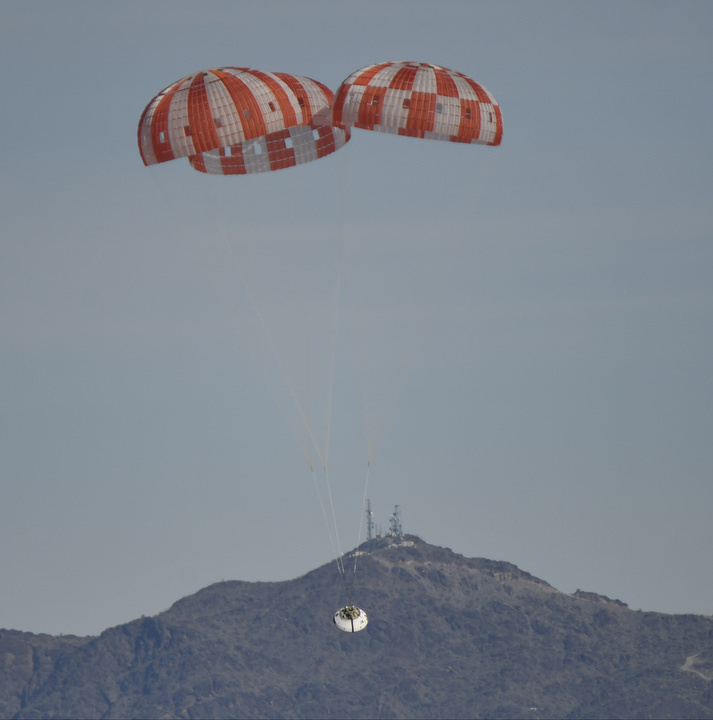 The descent profile mimicked the conditions an Orion spacecraft would see in the event of an abort during launch, beginning at a relatively slow speed of 130 mph (209 kilometers per hour) instead of the 310 mph (499 kilometers per hour) at which the parachutes would deploy at the end of a normal mission. 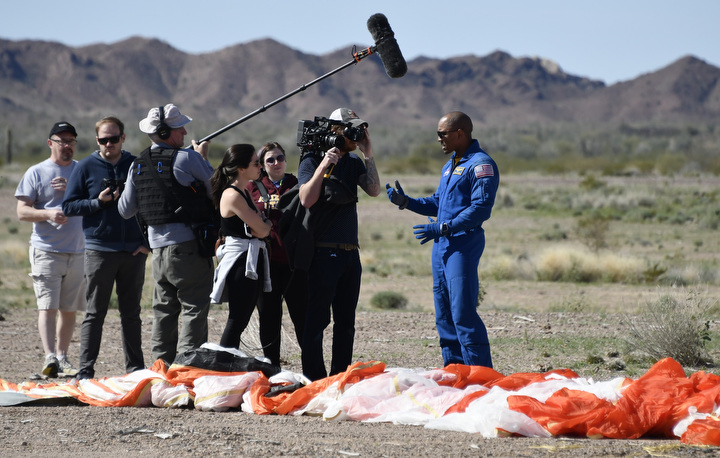 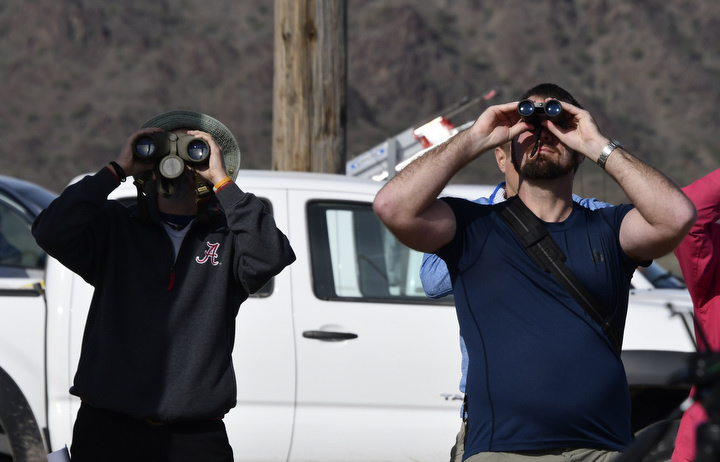 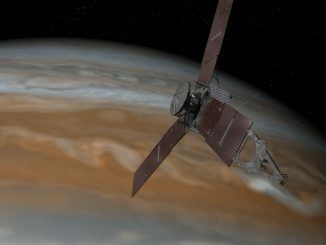 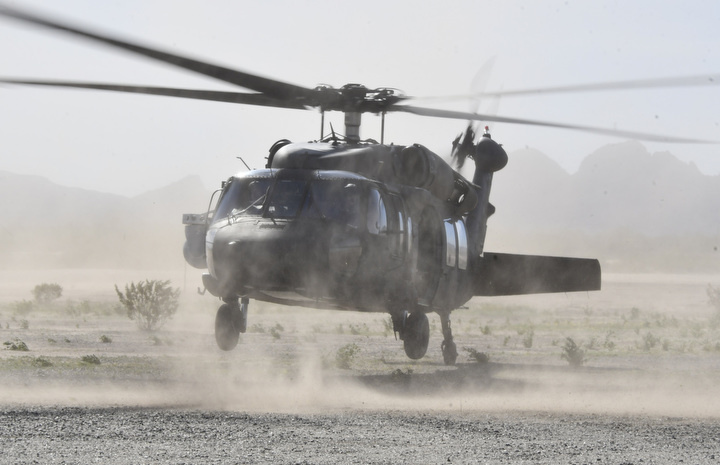 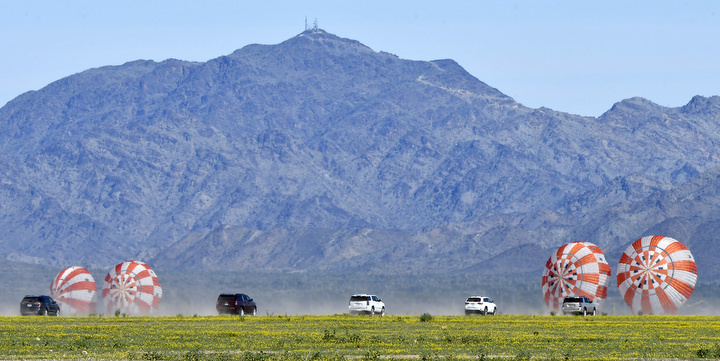 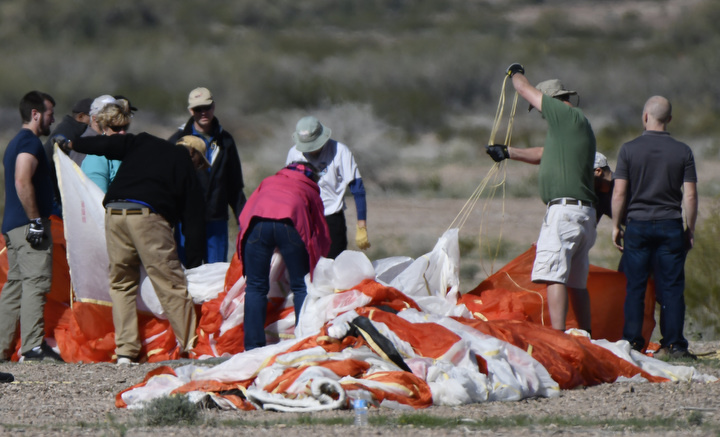 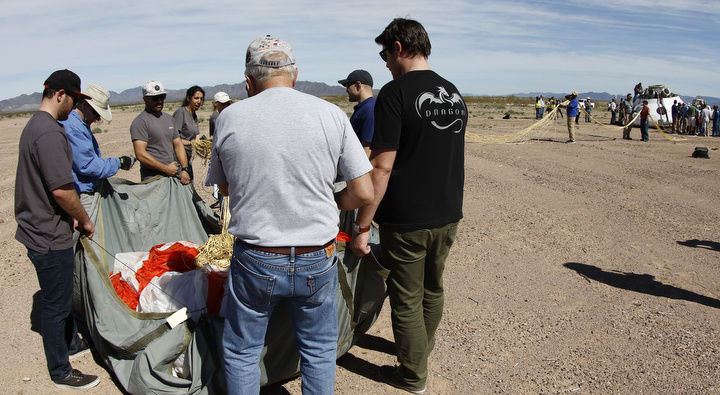 Engineers were expected to analyze the performance of the two drogue parachutes at low speeds, and the inflation of the three main parachutes, which were suspended 265 feet (80 meters) above the capsule before touchdown in the desert in southwest Arizona. 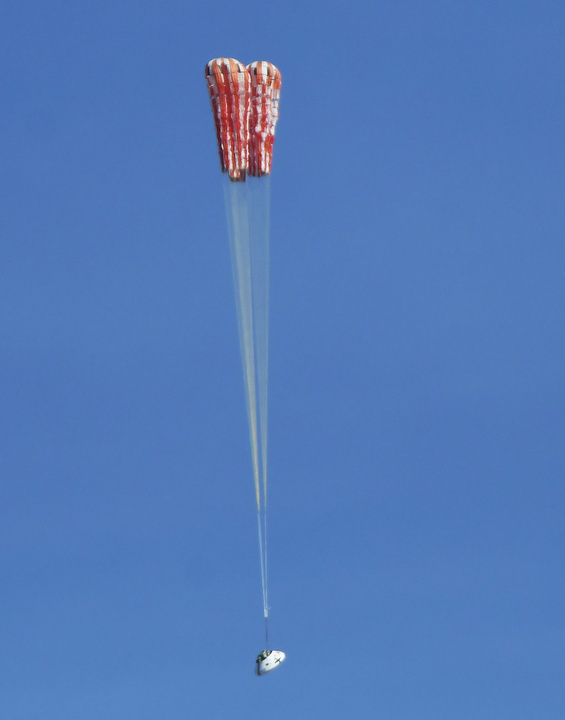 The test was the second of eight drops designed to qualify the parachute system for human spaceflight. 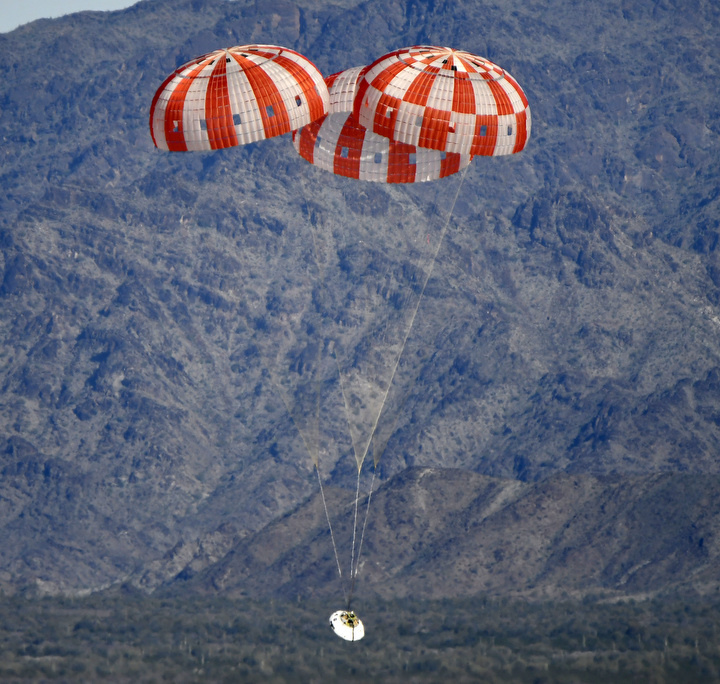 Instead of landing in the desert, Orion capsules returning from space or a launch abort will splash down at sea. 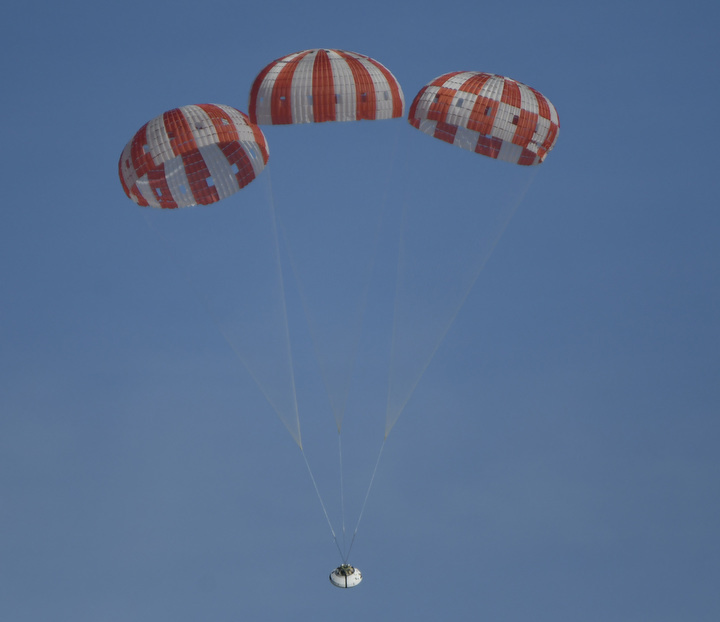 The Orion spacecraft has performed one space mission to date — an unpiloted test flight in Earth orbit in December 2014 — and the next mission is scheduled for no earlier than late 2018 on a trip into lunar orbit and back, also without astronauts. 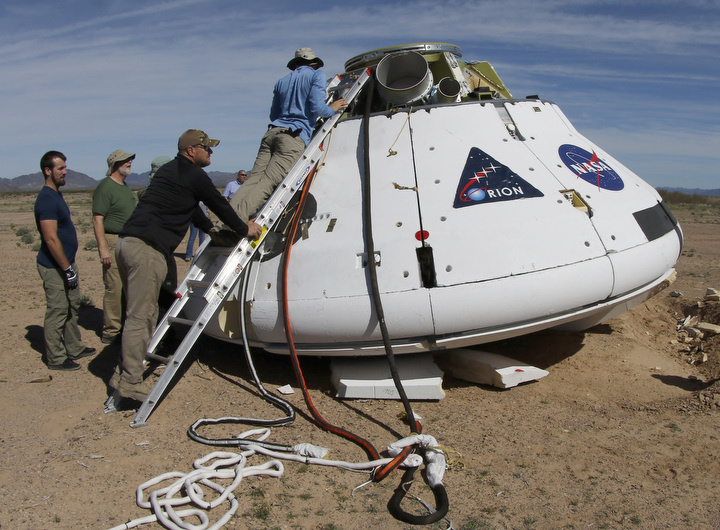 Following a request from the Trump administration, NASA is studying whether to add a two-person crew to the next Orion mission, which will lift off on the first flight of the agency’s Space Launch System rocket, for a round-trip voyage around the moon. 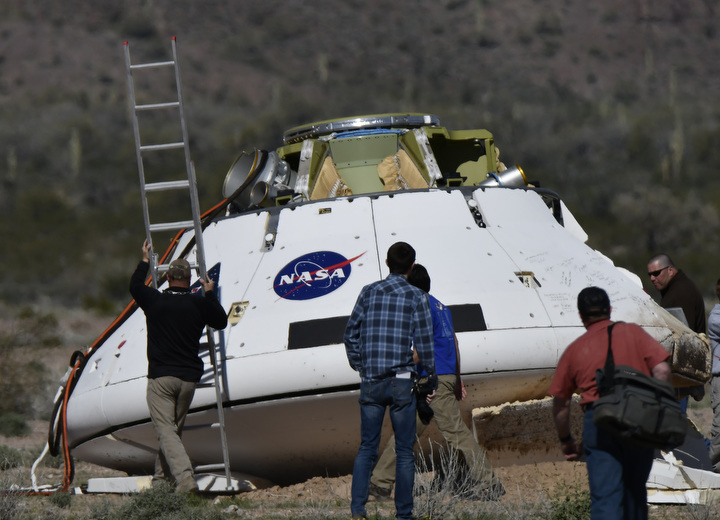 A decision to fly astronauts on the next Orion flight, named Exploration Mission-1, would delay the launch past next year to complete development and testing of the capsule’s abort and life support systems, and add to the program’s cost, officials said last month. 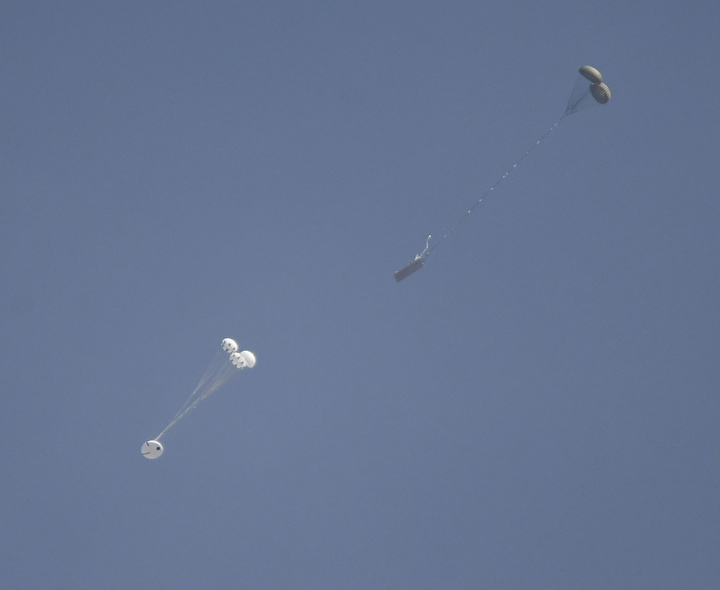 The on this page show the capsule’s drop from the C-17, its descent under parachutes, and the recovery team swarming around the engineering test craft after landing. 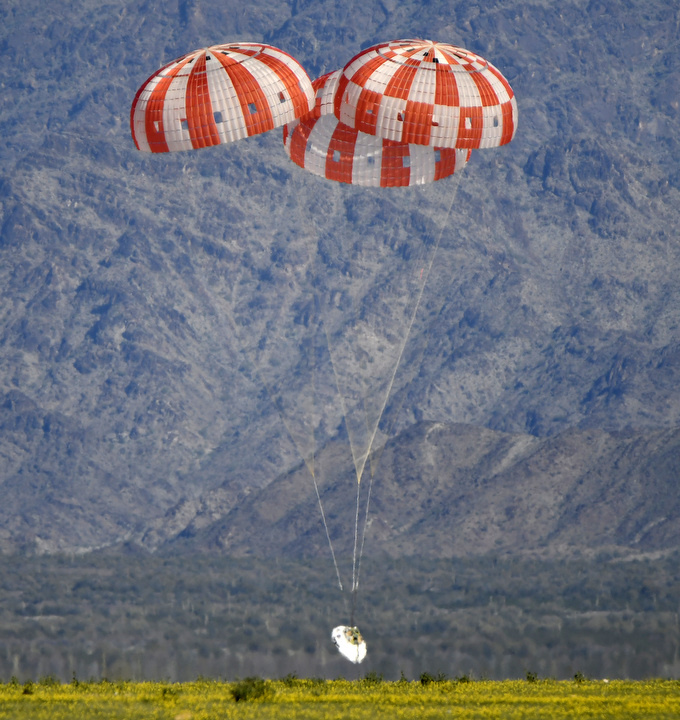 NASA and its Orion contractor, Lockheed Martin, plan to reuse the test parachutes flown Wednesday. 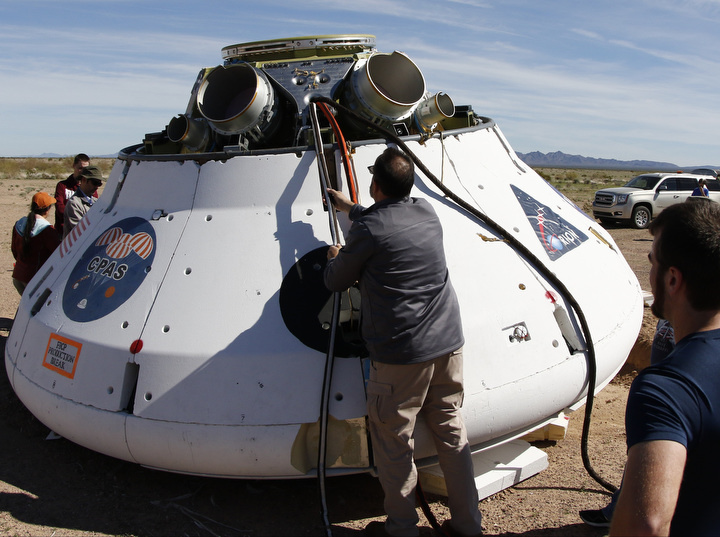 The capsule will also be refurbished, have new foam added, and reused on four of the remaining six drop tests. 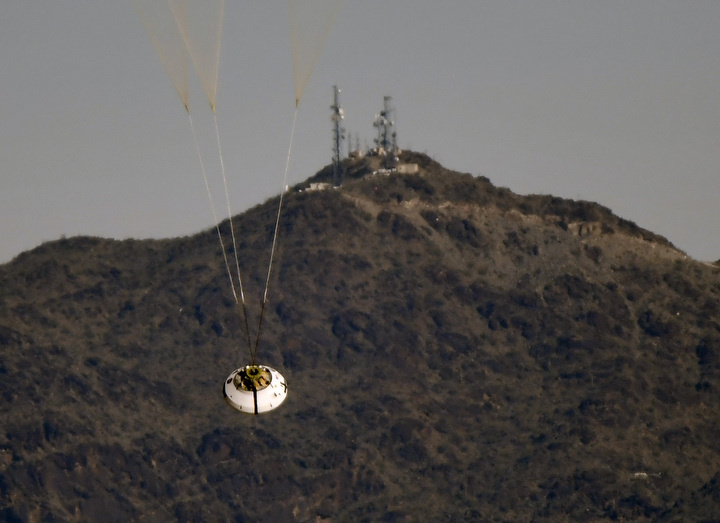 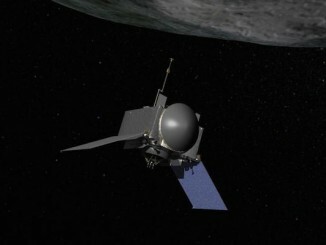 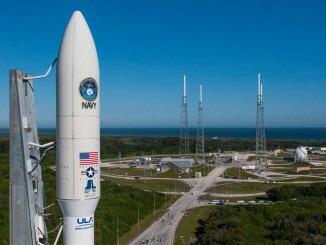 A dart-shaped mass simulator will be dropped on the other two qualification tests in the coming months. 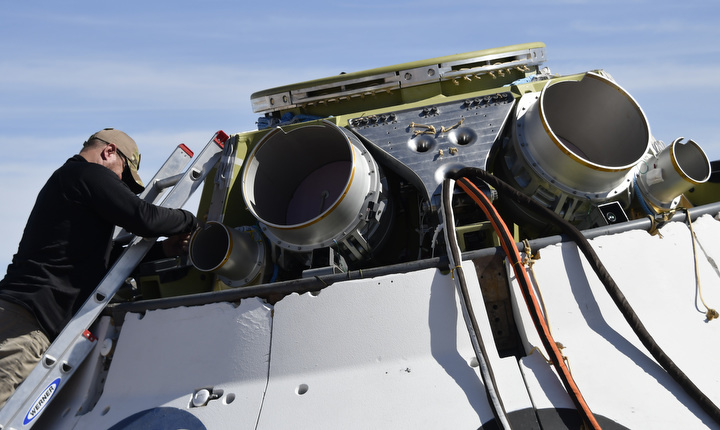 The foam damage seen in the images is expected. 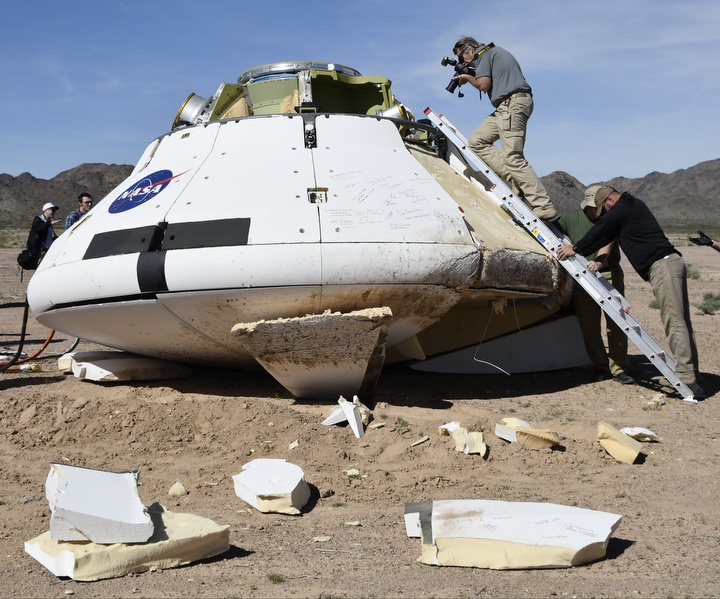 The outer foam shell is “sacrificial” and designed to protect the capsule’s primary structure and avionics, according to Jared Daum, a hardware and parachute engineer working on Orion’s Capsule Parachute Assembly System. 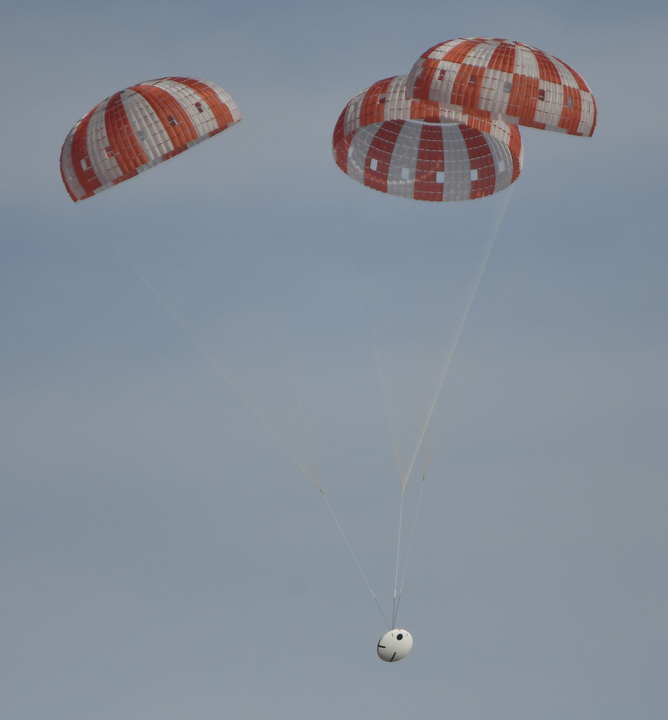 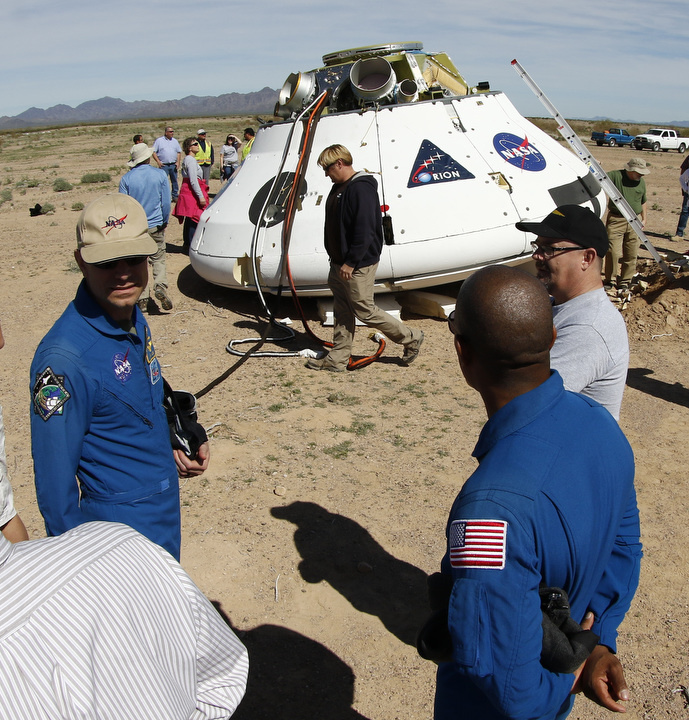 None of the 11 parachutes used on a real Orion mission will be reused, Daum said. 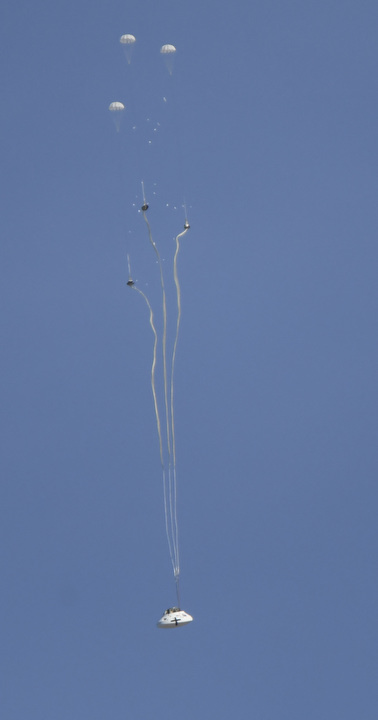 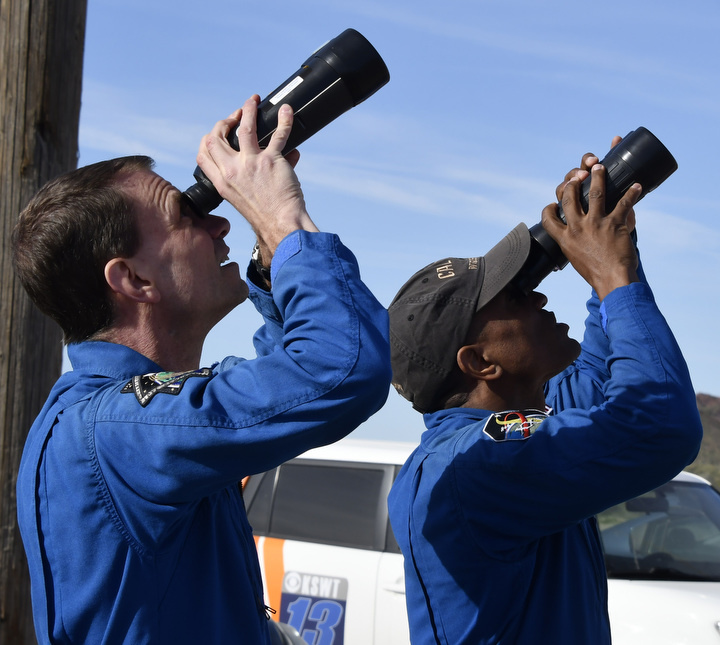 Engineers will review video and data recorded during Wednesday’s drop test as they prepare for the next in the qualification series. 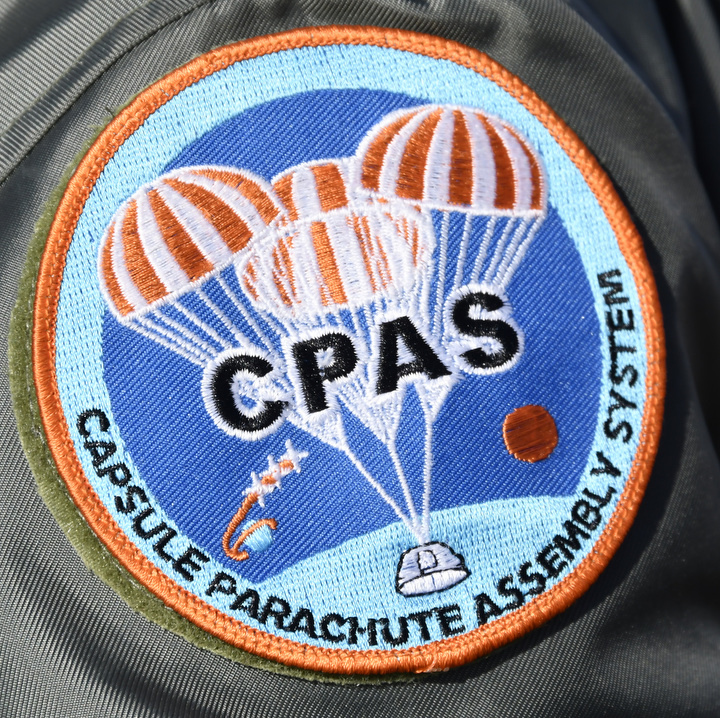 Technicians will also inspect the parachutes and capsule for tears and dings. 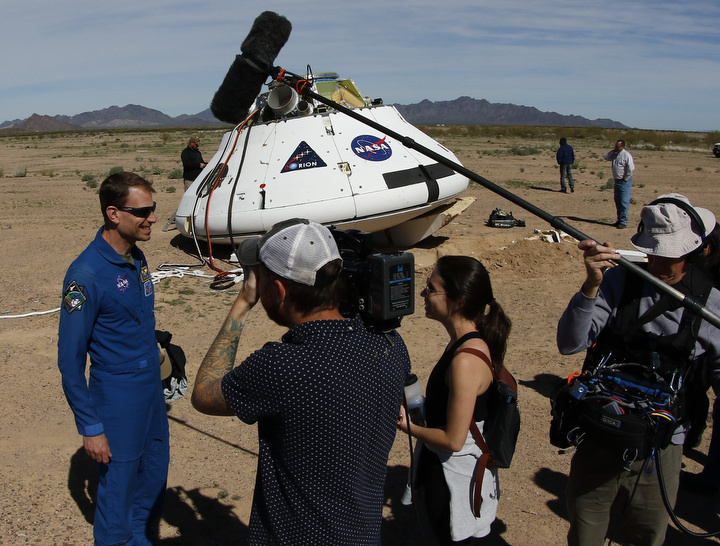 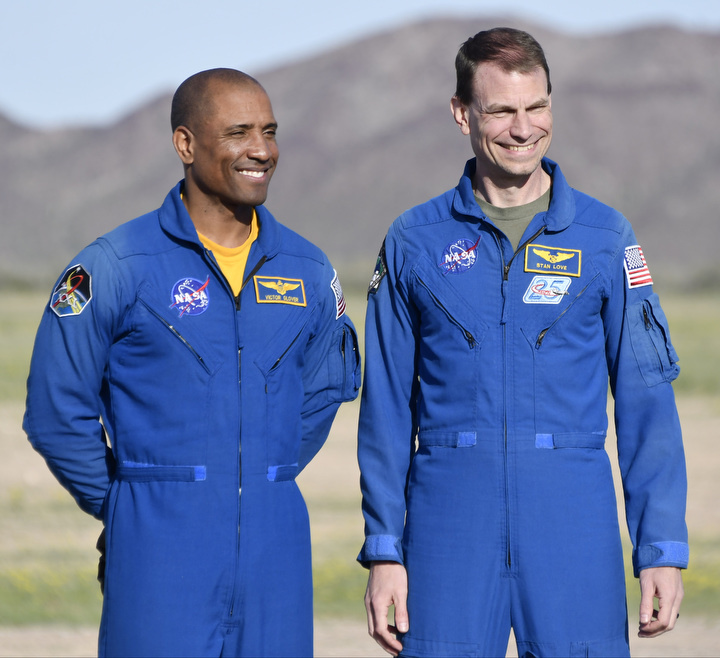 More images of the drop test are posted below, including views of astronauts Stan Love and Victor Glover observing the test, assisting in the recovery and discussing the event with news media.